Odoo Order Split: This module will be beneficial in the case when delivery of ordered goods is not possible at once, perhaps due to the shortage of stock or other reasons, it is intended to be split. Hence, it will allow the Admin to split the order. Therefore, when the customer orders more than the available products in the warehouse, the admin can split the delivery of available stocks at the point of time and rest of them later with a new warehouse reference. Order Split Plug-in will also provide an easy interface for managing the moving line inside the warehouse. The delivery of order on the committed time has become easy with this module. Warehouse manager can use this plug-in to make the order delivery in multiple batches. When the order is more than the availability of product, Admin can split the order and deliver the rest later with a new warehouse reference. Admin can even further split the order delivery as per need. Helps to manage move-line inside the warehouse. After buying this app from our Webkul store you will get the link for downloading the zip file. Simply download it and extract then you will see the order_split folder, now you will have to copy this app folder inside your Odoo addons path. 3. Remove the app’s filter and search for the order_split key. Firstly, a sales order is created using the website. Here we have ordered three products in different quantities. Now, after confirmation of sale order, let’s move to delivery orders. So from here, the Admin can select the order he wants to split and click on the SPLIT button. After clicking on the SPLIT button the split transfer popup will open. 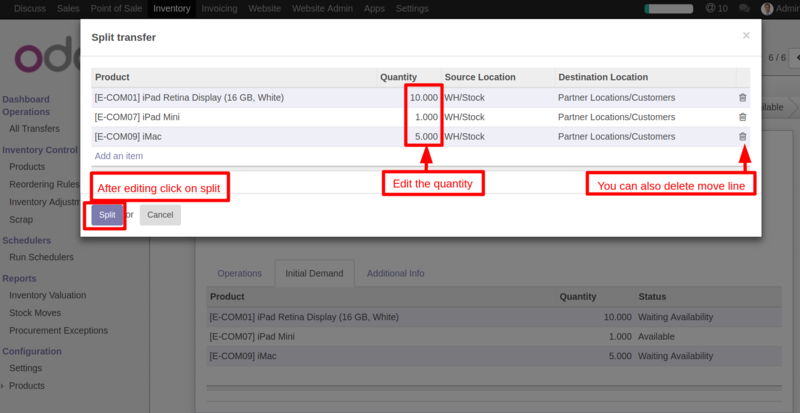 Edit the quantity in the order line as per requirement and click the SPLIT button. Since this module allows to edit order lines Admin can also delete the order line to make a separate reference. For example: If the Admin wants to deliver 5 iPad Retina Display Out of 10 then he simply needs to edit it from 10 to 5 and click on the SPLIT button. Rest of these products seems ready to be delivered with different warehouse reference. Now, let us assume that the Admin wants to SPLIT the order again and he wants to deliver iPad mini separately. In this case, he can delete other order lines and click on the SPLIT button. So, after splitting the order Admin can deliver iPad Mini later with a new warehouse reference as back order reference. While rest of these products seems ready to be delivered finally with a new warehouse reference as back order reference.